Are you considering hosting a Colour Run to fundraise for your school? They can be a tonne of fun and a great way to fundraise. 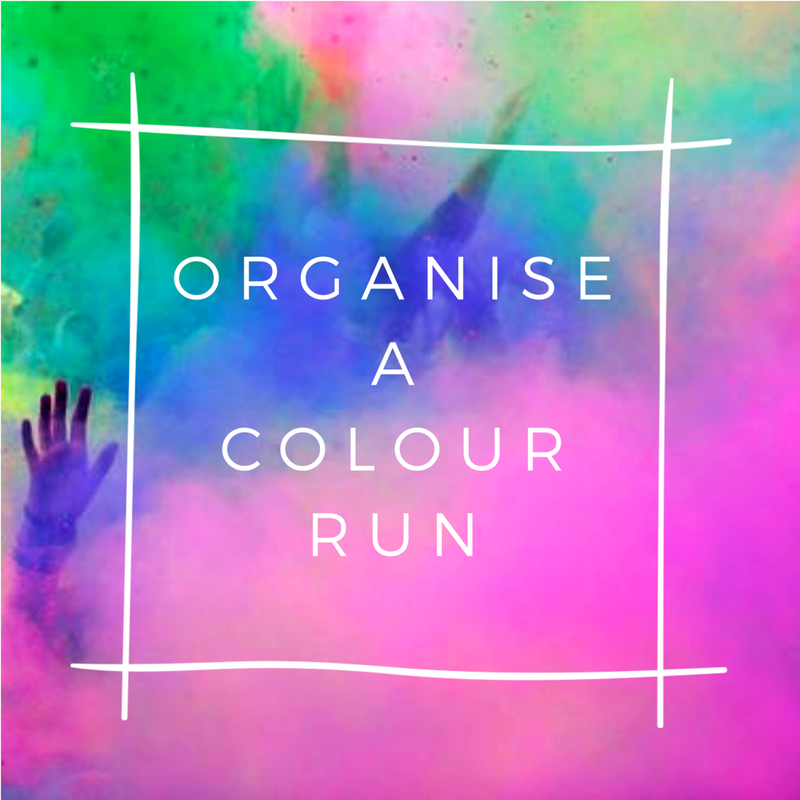 Here is an outline of things to consider when organising your Colour Run. This will depend on the resources available to you. You may not be able to utilise everything in a package a supplier can provide, or you may not be able to afford their packages and will need to source everything yourself. However, if you’re short on volunteers and time, they can arrange most of the things listed below on your behalf. It’s well worth investigating what they have to offer, especially since most take a percentage of takings, meaning no upfront costs for you. Will you provide a race kit on sign up? This can be something as simple as a white t-shirt or it can also include sunglasses, bracelets, tattoos and/or stickers. Will you charge an entry fee to help cover your costs or will you rely entirely on your communities fundraising efforts? When thinking about the entry fee, keep in mind not all entrants will raise money. If you are determined not to make a loss it might be worthwhile covering some of the cost of the set up into the entry fee. Keep in mind though, most entrants will want something to show for this (see race kits). You will need to provide fundraising materials for your event. This will include sponsorship forms, parent letters, posters, etc. It is also worthwhile considering an online sponsorship portal. Many suppliers have these facilities already set up and it can be worthwhile offering the option of paying remotely by credit card, as many people only ask for cash from those they see on a regular basis. Will you offer prize incentives for those who raise the most money? Will you offer this by school year, or just an overall winner? Keep in mind the time needed to select prizes that will appeal to different age groups. Consider asking for donations for these prizes to help reduce costs. This will be your biggest expense so source wisely. It is suggested that you will require up to 500g of powder per participant. This will depend on how many colour stations you have and how the colour is used. Most schools only allow teachers or responsible adults to throw the powder for safety reasons, but this could also help control the amount used. This will depend largely on the space you have and the age of your participants. If you have a large area you may just want to do a distance run, with colour and water spray stations along the way (spraying runners with water pistols between colour stations is a fun way to make sure the colour sticks). You may also like to set up an obstacle course run. Some people have suggested mud pits, hay bales, over and under obstacles and tyre runs as fun obstacles. We have even had one of our inflatable obstacles hired for a Colour Run. If you are thinking of hiring an inflatable course please keep in mind that most companies don’t want a huge clean up so will prefer entrants to go on it before colour is applied. For safety reasons they will also want to control how many are on the obstacle course at once. You will need to consider the number of participants when deciding how the course will be run. Will you stagger start times by age or perhaps by house group? In the case of an obstacle course, it may be helpful to have the older kids team up with the younger kids to help them through the course. You could award house points to finishing teams, as opposed to individual effort. Don’t forget to take advantage of photo opportunities, particularly at the finish line. It can help to remind people in future years of how much fun it is to participate, as well as a great way to market your fundraising efforts after the event. The great part about the colour powder is that is will just hose off the course. You may find, however, that your bus company is reluctant to allow students covered in colour to board the bus for the home trip. Consider a ‘blow-off station’ with a hair dryer or leaf blower to remove excess powder. Perhaps also suggest participants bring a change of clothes or a towel for travel home. If you want to enquire about rides for your colour run or any other event please contact us on 1300 CAMELOT.